"It’s been a painful transition from film to digital for many cinematographers. Brown takes the mystery out of it and presents the technical aspects of this change seamlessly. It is, after all, about art!" "As a practicing cinematographer who also teaches, I consider The Filmmaker’s Guide to Digital Imaging essential reading for my students. 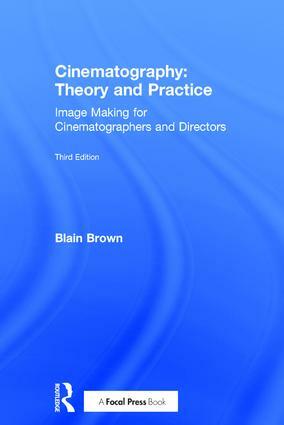 Blain Brown demystifies the technical processes of digital cinematography from the most basic to the more complex. Given the recent rapid development in this field, working professionals too will find this is a must-have guide. I’m one of them." Blain Brown was educated at C.W. Post College; M.I.T. and Harvard Graduate School of Design. He began in New York as a commercial still photographer before starting in the film business. After working as a gaffer, be became a cinematographer doing primarily commercials and music videos. After completing his first feature film, he moved to Los Angeles where he has been Director of Photography on 14 feature films as well as national commercials, promotional films, industrials, music videos and documentaries. He has worked in many states in the U.S. as well as Mexico, Canada, India, Italy, France, the Philippines and Jordan. His experience includes 35mm and 16mm projects, as well as 24P High Def, DigiBeta, BetaSP and DV. He has completed projects as a director, editor and screenwriter; with three screenplays produced. He has also taught courses in storytelling and visual communication. As a Director of Photography specializing in features and commercials, he is now based in Los Angeles. His books include A Sense of Place; Motion Picture and Video Lighting and The Filmmaker's Pocket Reference. His work can be seen at www.BlainBrown.com.